It's out! Today is the official publication day of my second book, The Lost Arts of Hearth and Home. You can find it at the usual places, like your local bookseller or Amazon or Powell's. Now that I have two books out, it must not be a fluke. So I think I'll indulge myself and talk a little bit about what it feels like to write books. Books are an odd, slow medium, not at all like essays or saying clever things at parties. There's a big gap between the audience and me. And things are rather messy on this side of the gap. For starters, I'm a physically awkward writer--I pull on my mouth, walk to the kitchen for a sip of water, grimace at people outside my window, lean on my desk, prop up the other foot. I start to sweat as the creative adrenaline builds. I frown and squint, and say nonsense things to the cats. If people are around I become conscious of all these mannerisms and distract myself. This is why I'm no good at saying clever things at parties. I work at a stand-up desk (a butcher block counter in the living room), which helps enormously. I suppose in my case it should be called a fidgeting desk, because standing still is not what I'm doing. When I'm tired of being upright, I do sit, but cross-legged or half-squatting on a bench. Sitting still makes me cold and tired, and I can't sit properly in a chair with my feet on the floor anyway, since all the blood runs out of my brain and into my feet. Low blood pressure. I'm a slow writer, too. Mostly I edit. All the fidgeting helps me become sort of disembodied, helps me reach that abstract state where ideas get wrangled into words. Walking is perfect for this, and so is the opposite sensory deprivation of lying awake at night (as pregnant people do, before they discover that a chopped liver sandwich is the cure for insomnia). But in general, the effort and concentration of writing and editing are so exhausting that I often dread the work, and can't keep it up for more than a few hours at a time. For months, as I work on the book, "the book" means awkward, ugly, sweaty solitude, and a general sense that I'm letting everyone down. Then it goes to the publisher, and they lay it out and design it and I feel slightly embarrassed about all the effort they're going to. Finally, after I've started to forget what I even wrote, "the book" pops into existence as a real book with covers and pages, and strangers read it and say things about it. If by chance they don't say, "What an awkward, ugly, sweaty book," I am rather surprised. Today, the book is indeed out, and people are saying stuff about it. I read the very first stranger's comments on it yesterday, when I found out that Publishers Weekly called it "an utterly charming collection of recipes and how-tos for the 21st-century hipster homemaker," and then compared us to "postmodern Elizabeth Davids." That made me so happy! The gap between the audience and me must be flatteringly large. You could almost think from this self-absorbed meta-writing that I'm making plays or novels. No. All this sweating and whatnot is just for straightforward instructional nonfiction, where for the most part I don't even have to second-guess the plot! I already know how the chutney is going to end. That's the other part of my job, and yes, I do know how lucky that makes me. I know how lucky the whole thing is, and what a gift it is to do the thing that makes me fidget most. Hello! I have been slowly savoring 'The Lost Art of Real Cooking' ever since I discovered it last Christmas, and so I was really excited to discover that a) a sequel was coming out, and b) the authors write blogs. 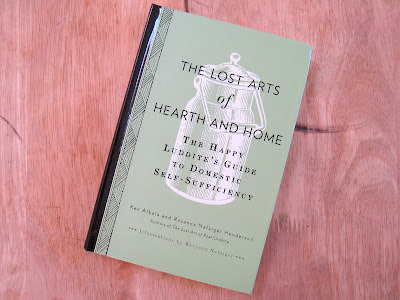 I can't wait to buy the 'Lost Arts of Hearth and Home'! Anyway, I just wanted to say that you are not alone. I write fiction and I make faces at the screen and sit in weird positions, and also unconsciously start imitating the mannerisms of my characters as I'm writing them. When I do this in a coffee shop, I'm sure people think I'm very strange. However, if that's what we have to do to write, then I figure we'd better embrace it. It's nice to know I'm not alone in the quirkiness, though! I am a GC student (I understand you are an alum) and would love to talk to you about your new book and what you have been up to since graduating GC! You can reach me at kscholfield@goshend.edu and we can figure things out from there! Funny isn't it, the dread? And then suddenly one is over the hump, sucked into his/her own head, wholly absorbed. Maybe if it's not hard it's not good. Your writing is exquisite. How interesting. I am completely opposite in my writing habits. I never look back and it spews out of me so quickly that before I realize what's happening I'm done. Not that this is a better way at all! It just surprises me because our words complement each other so nicely. And sometimes people mistake your words for mine. Oh I adore your writing. But I disagree that you always know how the chutney is going to end. In all the adventurous culinary experiments in the book it seems there is room for surprise. Both books are thoroughly enjoyable; I always open them up to get inspired when I'm feeling dried out and crusty. Please keep it up-you are a delight.